Idli upma is a common South-Indian breakfast/dinner recipe that can be prepared in a jiffy. It is very simple and delicious recipe made with left-over idli's. I have already posted few other recipes with left-over idlis. You can check them here - Idli Manchurian, Kaima Idli. This upma is almost the first thing that comes to mind when there are leftover idlis. I am gonna post the basic Idli Upma recipe today, check the notes* for more variations. 1). Crumble the leftover idli coarsely with your fingers and keep it aside. 2). Heat oil in a pan, add mustard seeds and let it splutter. Then add channa dal, urad dal, green chillies, hing and curry leaves. When dal turns golden brown, add finely chopped onions, green chillies and saute till onions turns transparent. 3). When the onion and peas are cooked, add salt, turmeric and hing, cook for 2-3 minutes. In a low flame, add the crumbled idli and mix well until combined. Check for salt and garnish with coriander leaves. Serve hot with the chutney of your choice. I personally like it with Tomato Chutney ! # Make sure the idli is cold so that it will get crumbled nicely. 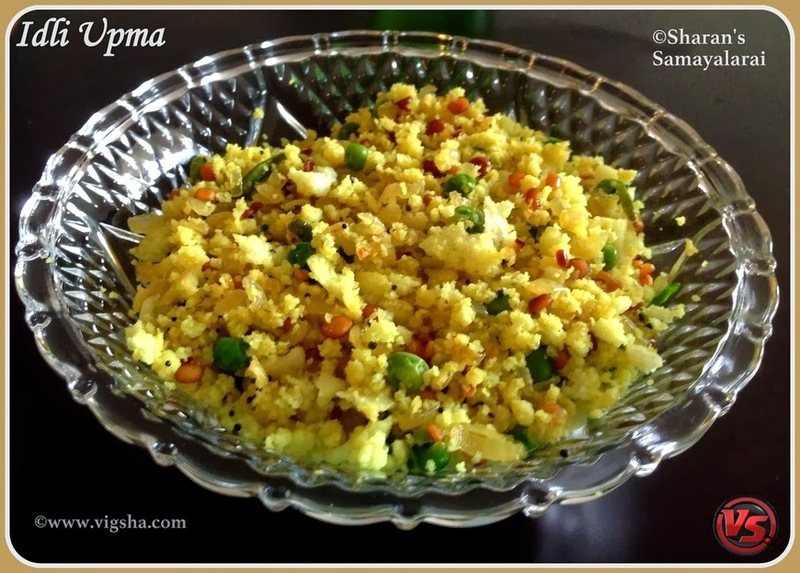 Do not prepare this upma with fresh/hot idlis as the crumbled idlis may turn very sticky. If you are using fresh ones, make sure you cool them well before crumbling. # Green peas is optional, you can add/omit veggies of your choice. I used frozen peas so I have added it along with onions. If you are using boiled veggies, you can add it towards the end. # Shallots tastes better than the big onions. # Add lemon juice towards the end for lemon flavored upma. # To get a crunchy taste, add roasted peanuts or cashews. # To make the upma spicy, you can add idli podi with a tsp of ghee while adding the idli pieces for a different flavor. Ghee helps to blend the idlipodi with the idli and it sure alters the taste. Ghee is optional though ! # Adding a tsp of coconut also adds a nice flavor.